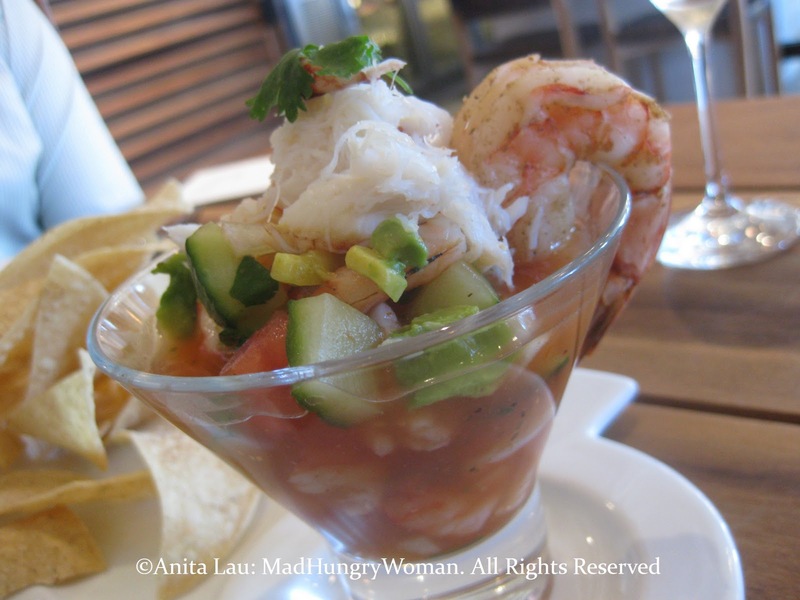 Awhile ago, I was invited to a preview of this restaurant to see first hand what the new Tommy Bahama Bar & Grill in Laguna Beach had to offer. 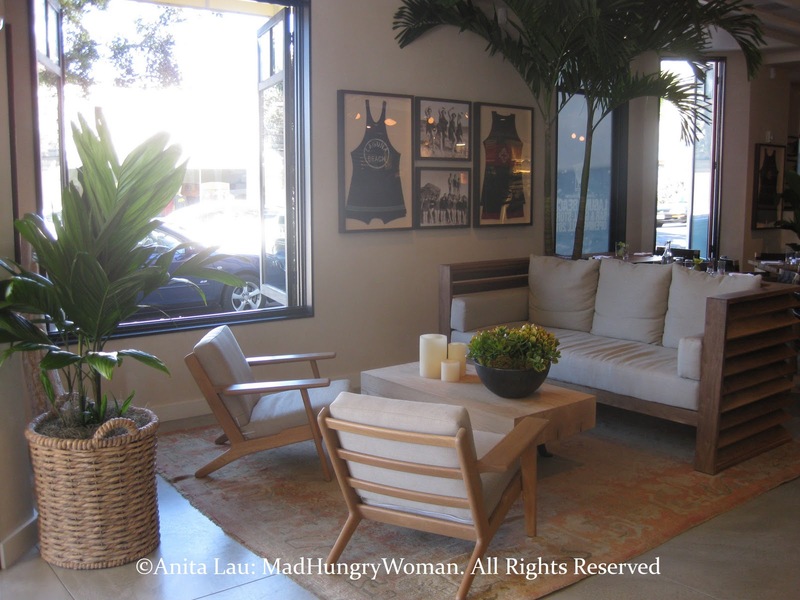 The restaurant is attached to the Tommy Bahama store and encompasses a relaxed beach feel so perfectly suited to its surroundings. From some of the tables, diners can enjoy scenic views of the ocean while others can keep an eye on what’s going on through the glass of the “open” kitchen in the back. While we waited for others to arrive, we were treated to some hors d’oeuvres going around. There was a crostini topped with goat cheese, however, I especially liked the lobster corn dogs, little bite-sized corn dog shaped morsels with a surprisingly delicious crab interior. These were served with house-made ketchup and mustard, just like you would with a regular corn dog, but there was nothing regular about these very adult appetizers. Guests were offered the opportunity to create their own cocktails and I made myself a mojito with extra lime and mint. I should have held back if I’d known that every course to come would have a wine or beer pairing of some sort….. ay carumba! After we all sat down, we were presented a tasting selected by Chef Donley to showcase his menu. Shrimp Avalon was a refreshing cold starter comprising chilled tiger shrimps, dungeness crab, spicy vegetables, lime and served with fresh made corn chips. Succulent shrimps with the sweetest of crabmeat kicked this, otherwise pretty standard, shrimp cocktail up several notches. Beautifully presented and it tasted just as wonderful as it looked. Ahi tuna tacos are served in a wonton shell with Asian slaw and drizzled with wasabi lime infused avocado sauce. The sashimi grade ahi had a wonderful freshness to it and the crunchy wonton shell makes for a textural contrast which combines together for a tasty finish. I’m not sure I would personally order this dish but I did enjoy eating it. When it came time for the Arctic Char, I was still relishing in the deliciousness that was the shrimp BLT and really wasn’t focusing on the piece of fish placed before me. However, when Mr Rob Goldberg, VP of restaurants for Tommy Bahama, seated next to me, exclaimed that this was one of his favorite dishes on the menu, I wasn’t going to be rude and so took a bite. Actually, it was good, perfectly seared on the outside, moist on the inside, sitting atop a sweet pea risotto with very good consistency. 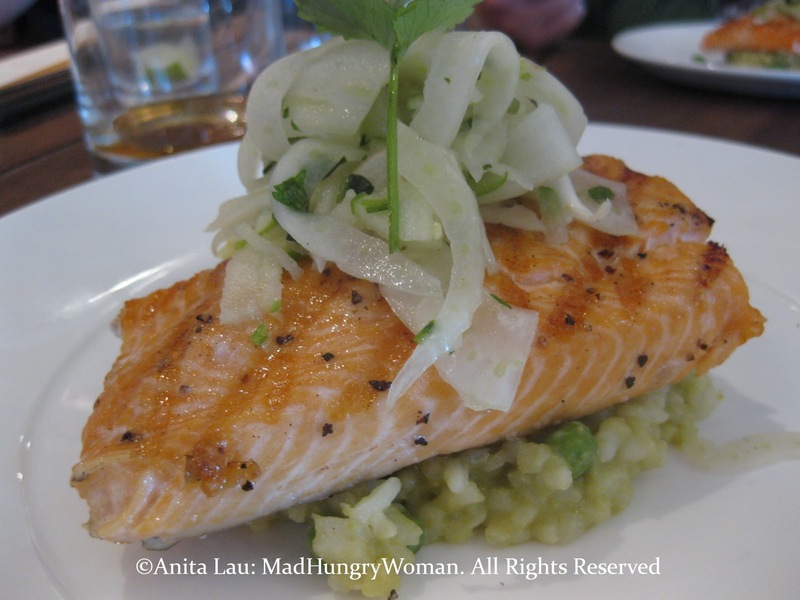 The apple fennel slaw lends a refreshing component to the dish with the fennel very mild and not overpowering the delicate taste of the fish. But I think the BLT really did a number on me so although I liked the Artic char, I was still feeling pretty heady about the sandwich. And as if we didn’t get enough to eat, here comes a trio of desserts. Triple chocolate cake was so decadent I really can comprehend how anyone can possible polish it off on their own without help, but I was told someone at the table had indeed done so. My hat off to you! That’s a lot of chocolate love there! The cake part was very rich on its own, add to that the sinfully gooey chocolate ganache and it was enough to put me into a diabetic coma. I highly recommend this even though I think it would take four people to capably finish it after eating a meal — I don’t know, it would just seem like the sensible thing to do. Those wanting to reminesce about their childhood should definitely try the Root Beer Float. It arrives in what would look like a gargantuan mug to a kid, but no matter how old you are, you will feel like a kid again after a few sips! Abita root beer is used and unlike regular root beer which has high fructose corn syrup, this one uses Louisiana sugar cane as its sweetner. I wish they would offer this in a smaller version. 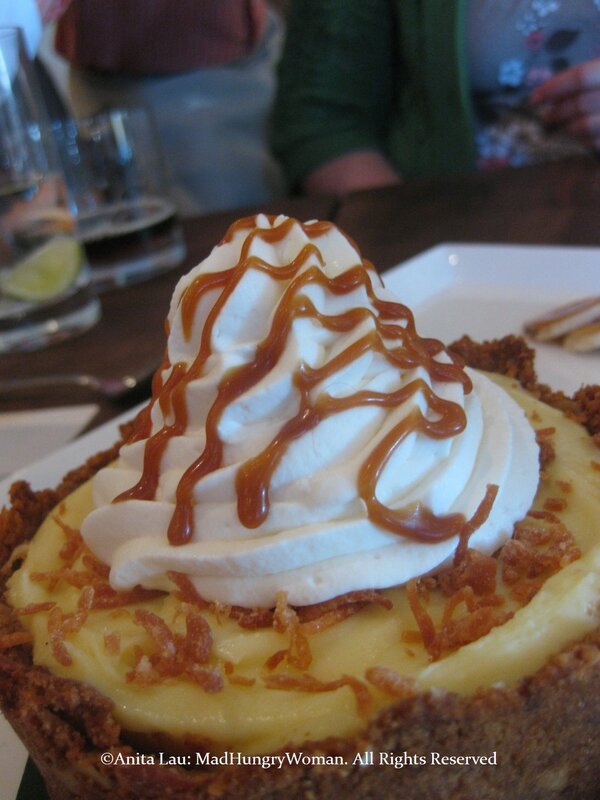 Finally, banana cream pie arrives and I’m about to explode. I was only able to eat a few bites and albeit a tad too sweet for me, I loved the thickness of the filling and how nice and texturally pleasing the crust was. After an almost 3-hour long meal mainly stuffing my gluttonous self, I had to reschedule my dinner plans for 2 hours later just so I could make room for yet another meal in my life. I’ve been trying to find a day to return to Tommy Bahama Bar & Grill and my hectic schedule hasn’t allowed for this yet, but I can hear that Shrimp BLT calling my name louder as the days go by! >I loved this meal. Wasn't fancy, but fit the bill just fine. Hopefully we can go back soon. >I've been wanting to go back again — for lunch since the views are nice — but haven't found the time to do it yet. Maybe we can figure out a day and time to re-visit. Will probably be in the new year unfortunately.